If you can hear your window motor turning but the window does not move, then you probably need to replace your regulator bushings. 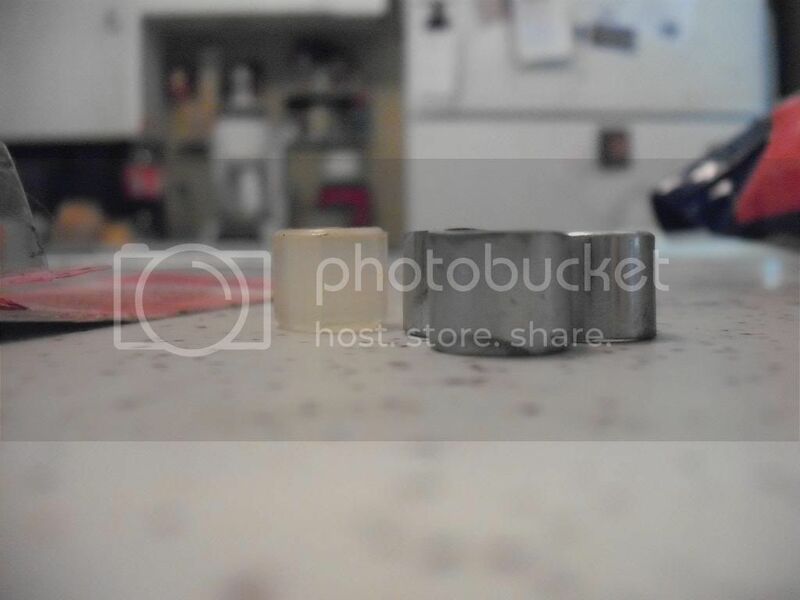 This is my take on using steel rather than plastic for these bushings. The process is the same for any of the options below with the modifications described. I have not had any issues with this, but I am not liable if you damage/destroy yourself or your stuff. You will need to remove the small c-clip on the top of the steel gear. 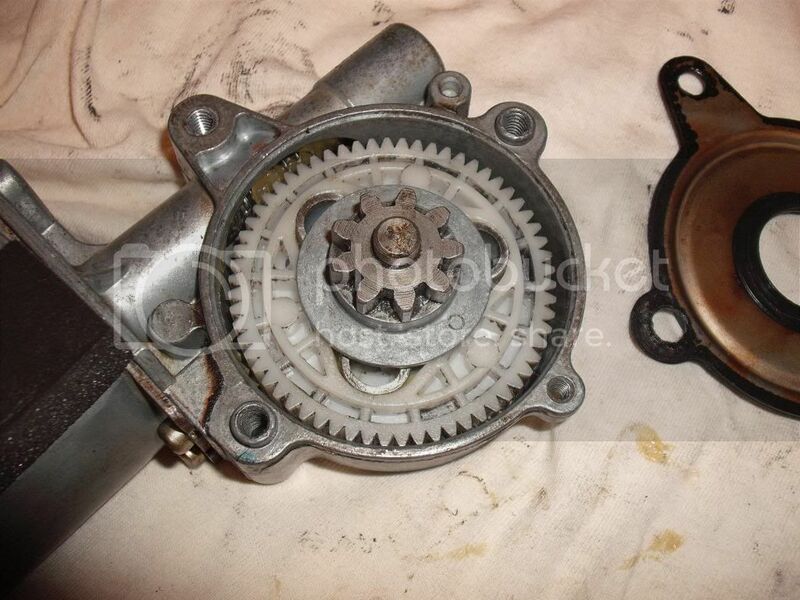 Then pull straight up and remove the steel gear from the plastic gear. 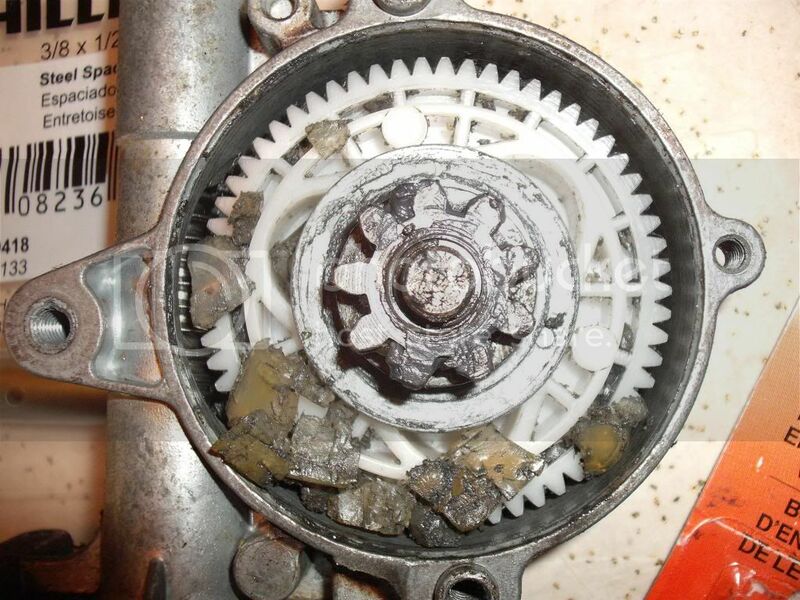 Remove the plastic gear from the housing. Use your patience to remove all of the small bits of plastic and old grease. The plastic pieces can get stuck in the worm-gear so try to get it all out. I decided to pull the motor housing off to get at it better. I recommend you do NOT do that, because it is a HUGE pain to get back together correctly. 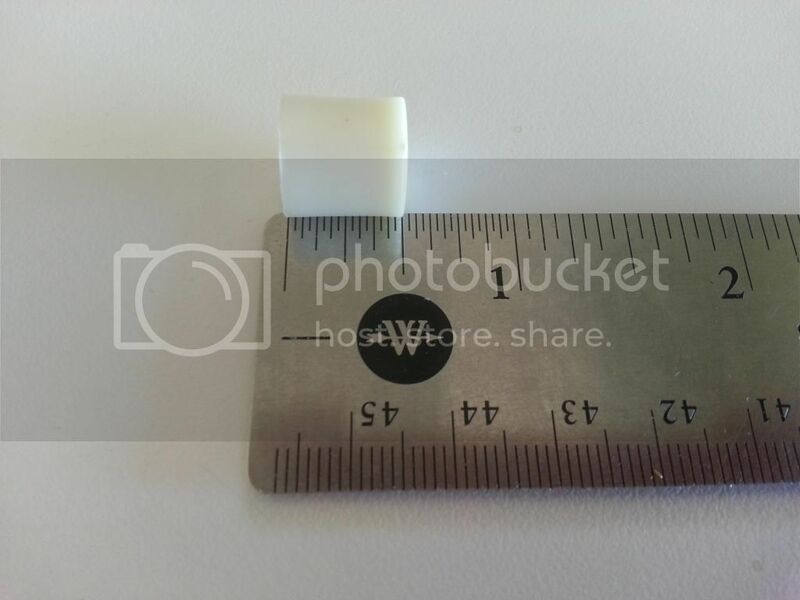 You will then need to cut the steel spacer into 3 roughly equal pieces about 1/2" long. I suppose you could just use 3/8"x1/2"x1/2" spacers if you can find them. I didn't explore that. 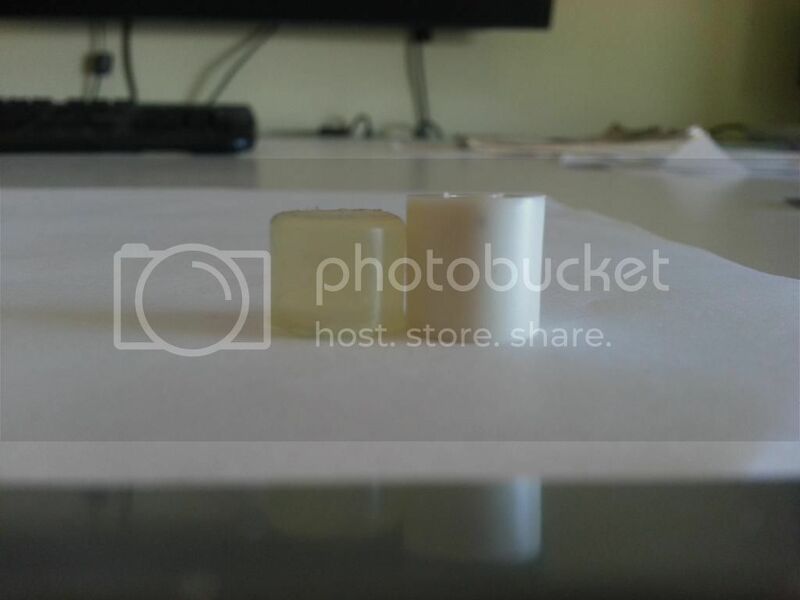 New plastic bushing versus new steel bushing (for comparison). Now take your 3 steel bushings and set them in place in the white plastic gear. Then take the steel gear and set it in position in between the bushings. Mine was kinda tight, so I used the channel-locks to work it down until it was fully seated. If you do this, be careful to work it around evenly as to not break the white plastic gear. 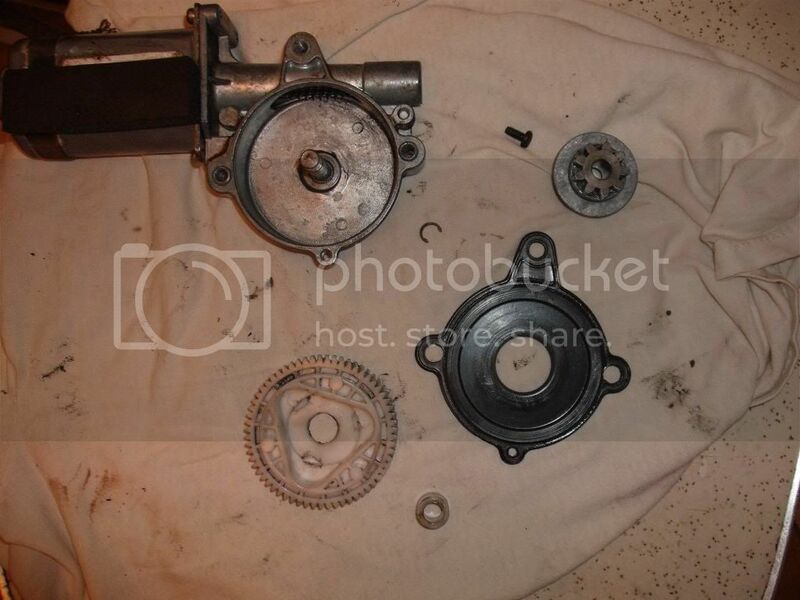 Take the assembled gears and apply a light coat of grease to the back side of the white gear, front side of the steel gear, and the teeth on both. Now drop them into the housing, making sure the teeth mate with the worm-gear correctly. Re-install the c-clip on top of the steel gear. Re-install the gear cover and screws. Re-install the regulator into the door and enjoy not having to fix it again next year! Last edited by jco1385; 08-05-2015 at 08:00 AM. Awesome write up, looks a simple yet very useful mod. Good tutorial. I made the mistake of taking the motor housing off as well when I was cleaning out the plastic pieces. I wouldn't recommend taking it off unless someone knows of an easy way to put it back. I used a piece of paper I folded into a half circle to hold the springs down as I inserted the shaft back in, and then it took a couple tries to get the housing back on without moving the shaft out. Wasn't worth it for the few pieces of plastic I got out. Good to know this happened to me Saturday night. I haven't looked at it yet. Thanks for the write up. Did this today to fix my Pass.side. It worked great good write up. almost looks like a pilot bushing will work for this any body try this? Basically anything roughly 7/16" x 1/2" round will work. Last edited by jco1385; 08-05-2015 at 07:52 AM. Thanks for this. I just bought a 1996 T-Bird that's going to need this done to both sides. What is it with Ford and their crappy window regulators? My previous car was a 2004 Grand Marquis (Killed in action by Bambi) that I had to have both front window regulators replaced. I'll probably fix mine over the New Year's holiday. I need to try this. Seeing how i will never own another car besides a mn12 i see the 40 pieces for 1.48 being a good investment. My passenger windoe you can hear the motor just slipping. The drivers rolls up smooth till it gets about 1" inch from shutting thrm it binds and after a few seconds it slips up by itself or by holding thr button. I know i need new bushings on the pass side. What do u guys think is happening with the drivers side.? 94Thunder - on my car, the window windlace (?) that it slides into is slightly bowed. I can straighten it out and the window works perfectly for a few months, then ... time to grab the screwdriver and widen it out again when it starts to bind. IOW - Check EVERYTHING in the path to find where it's rubbing. Don't forget to lubricate the guide rails for the scissors action. I've replaced the biscuits before, did it on my '85 Bird back in the '90s and most recently my '92 Bird that is 22 years old and still oem on pass side. Motors are smooth, windows fast. I think Ford used same motors since the mid '60s anyway. I think they are a decent enough design, they have a designed in weak link. 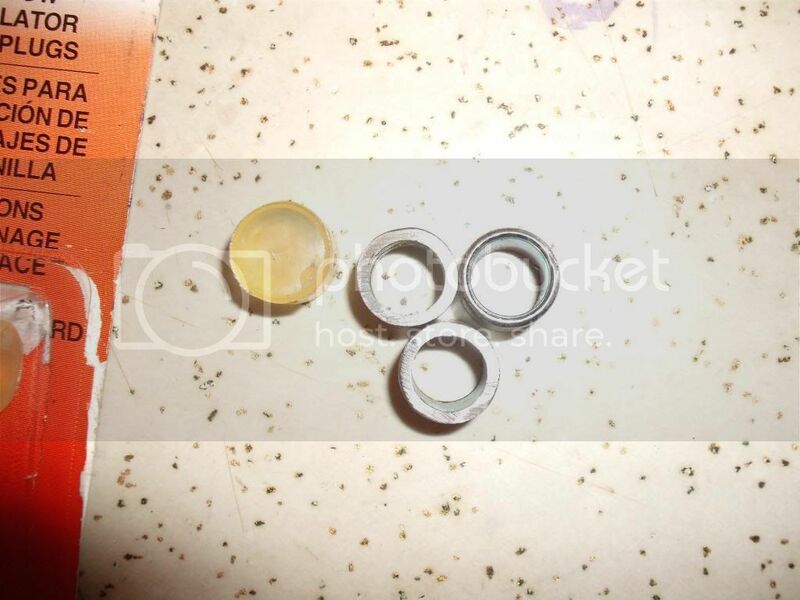 Terrific pics & directions for installing either steel or plastic bushings. A big thanks to jco1385 for sharing this info with those of us who lack experience repairing these regulators. The driver's window on our 95LX. is a definite candidate for this fix & I plan to refer to these directions when I begin the task. Mine gets stuck sometimes due to old crappy tint residue that gets warm and sticky. While the door panel is off, you can grease the moving parts. After you fix the motor run the window up and down with the panel off to see if you can tell what the issue is. I edited the first post to provide the OEM style part number. Well thats good advice, i doubt the door has bent or even tooken apsrt before i did it.. However i do believe i dnt have enough lu rication on the scissors action. I sprayed a lil wd40 on it and it seemed to help s tad. Bit. My thing is the doors window track has never been replaced and its rivoted in.. Ehich is gonna be a pita to just get a new one and install it. WD40 will remove the lubricant, not lubricate the movement. I thought the bushings were made out of plastic for two reasons: One, in the event of a child's neck in the way, these bushings would fail first, and prevent decapitation. The other reason is that the bushings would be the first item to wear out from normal use, so the other parts would last longer. This mod makes the plastic gear the "weakest link". 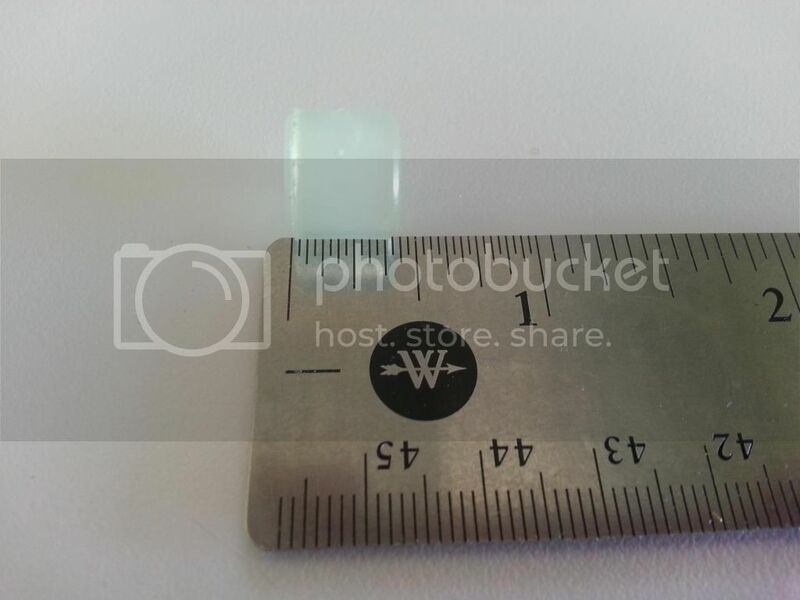 How long do the plastic bushings typically last? If they wore out every 5-10 years, I might be inclined to go with steel. But if the plastic is good for 20 years... I'd go OEM. The reason that I did this with steel is because it was my 2nd time going in there to replace the plastic pieces. The first set lasted about 2 or 3 years before they gave up. I don't think the motor is strong enough to decap a child. I have also not broken any windows with this mod. I still havent had a set of 94+ window motors go bad because of the bushings. Never had to tear them apart to see what the difference is. As for the decap .. stick your hand or any other sensitive body part in the track and roll the window up. Its a lot stronger than it seems. Ok, time to revive this thread again. A big thanks to "jco1385" for the directions on doing this rebuild. I went with the nylon bushings, but followed the directions and the window is working just fine. I have another alternative that I am going to try. 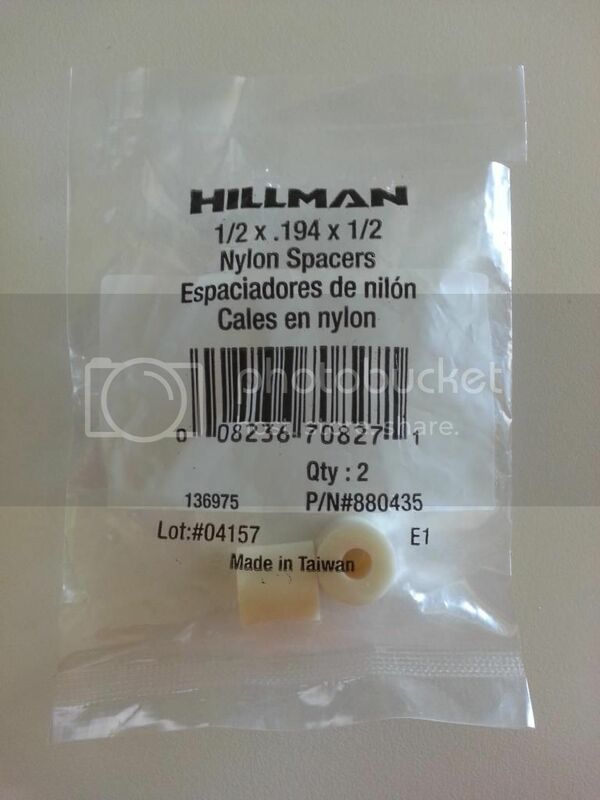 I found these nylon spacers for $0.99 at Lowe's. They are about 1/16" taller than the Dorman pieces. If it's too long, chuck it up in a cordless, and use a razor knife to trim it. The nylon pieces from Lowe's do work, but you have to trim the excess off or the c-clip won't go back on top of the metal gear. But for $3 to do both doors I'd say it's worth the effort, since the Dorman pieces are about $8 for one side (3 pc). Just use a sharp razor knife to trim them. I edited the first post to put all of the part numbers in one place for the different options I've tried. I also edited the title so it may be easier to find in a search. Sticky?? Thanks for posting the information JCO.. I chose to go with the Dorman bushings in lieu of the steel bushings.. The window motors are so easy to remove, and rebuild..I didn't find it necessary to use the steel bushings..
Somewhere down the line if these bushings fail..I'll try the steel bushing mod instead..
For those who are interested, I measured the Dorman pieces. I used a set of 9" Starrett calipers so the decimal measurement should be good. Thinking about maybe making some out of UHMW. Last edited by bowez; 08-23-2015 at 12:50 PM. Steel ball bearings work perfectly also.